Thanks. I don't understand it...but at least I know it is not something I can fix. Well it could be that Google has put restrictions on what Webroot can or can't do with our Mobile/Androids. And were forced to remove these programs. I am just tossing that out there because I do not know why either. I have call blocking on my Android but I only can block so many callers. Is it possible this feature will be brought back? I'm already getting SPAM calls again, since the removal of the feature. Also, the feature is still being advertised as being part of Webroot Mobile. I doubt they'll bring it back. Google Play is limiting access to SMS and Call Logs permissions and apparently security / antivirus use cases are not part of the valid use of these permissions. One of the other security apps I have on my other Android device had to take out similar features in their app 2 months ago. Other the other hand, telecom & cable providers , FTC and the FCC are working together on a set of common rules and protocols called STIR & SHAKEN to help minimize spam and robocalls calls as a free service. I know Verizon started to roll out their "Call Filter" service last week to have a free and paid tier. Other providers call it "Call Verification". Check with your provider on how they approach rollout as the FCC mandated them to implement by year end. We actually had a survey up (for about a month, roughly a year ago) about which Mobile Protection features people use. The call/sms blocking was one of the least used. Not saying this is 100% the reason, however I do know the survey results were looked over by the Product team. Hmmmmm. I never saw that survey? Considering this article from @Jasper_The_Rasper regarding the rise in SIM swap fraud, which exploits SMS as an attack vector, it's surprising that Webroot would remove such protection. Was it really that hard to support these features? It was posted in the Android beta section, and then later moved to the News & Announcements section where I featured it on the home page for a good few weeks. We had quite a few responses too. Survey is of course closed now, but yeah. I was thinking the same thing @BurnDaddy about not seeing that Survey. But now I remember I took that Survey and I am sure I said that I use all the features of the WR Mobile Antivirus. The Call & SMS Blocking was an important feature for me. Really sad that the Developers took that program away..
Yeah there were only a handful of people that claimed to use those features. The problem is not solved. AARP this month stated in an article on scams that "telemarketing experts estimate that over 50 percent of all call to our cellphones will be scams in 2019." Without any explanation you removed the SIMS call blocking feature that we have paid for. You still list it as a feature and have directions in your help on how to use it. The unscientific marketing survey you refer to that only limited people claim to use it is no way to run a business. Whose side are you on? The scammers? Either restore it or give us a reasonable reason for why it was removed and refund party of our cost. I totally understand and agree with you on all accounts. Let me ping our Community Managers @LLiddell & @freydrew and ask them why the consumers are being misled by outdated information in their advertising for a feature that no longer exists. Agree that Webroot needs to be more transparent in managing syncing app store description to current supported feature. 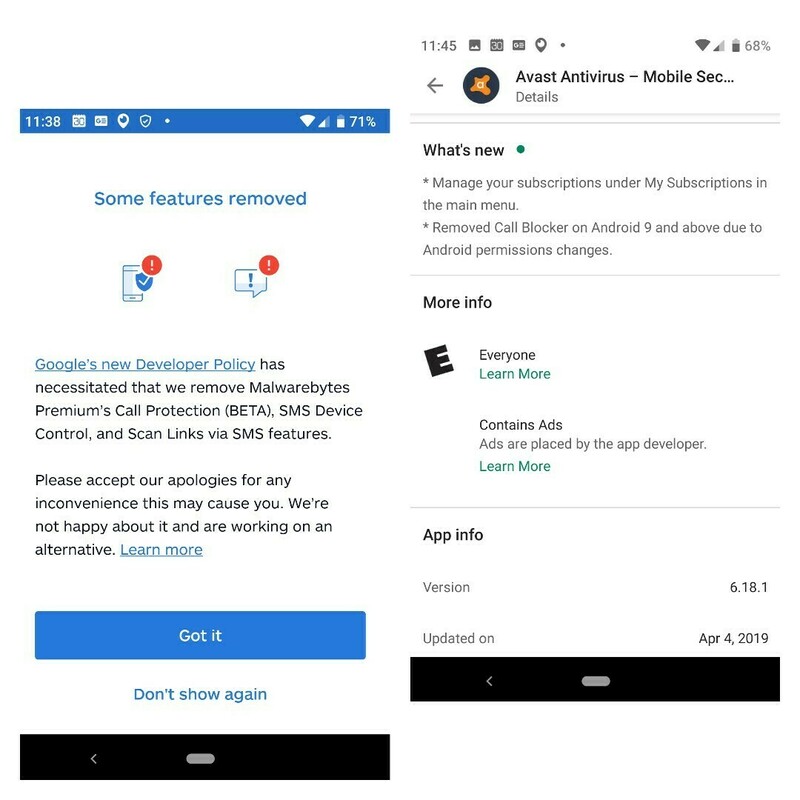 In general, antivirus vendors supporting Android on the Play Store are undergoing major functionality changes as Google is mandating restricted access to user data, Call Log and SMS permissions, unless it is a core feature that will render it non functional if left out. Specifically mentions security and anti-virus apps as one of the invalid use cases. Took a quick look and April 2019 seems to be the month that major AV vendors have started implementing their interpretation of Google's request. 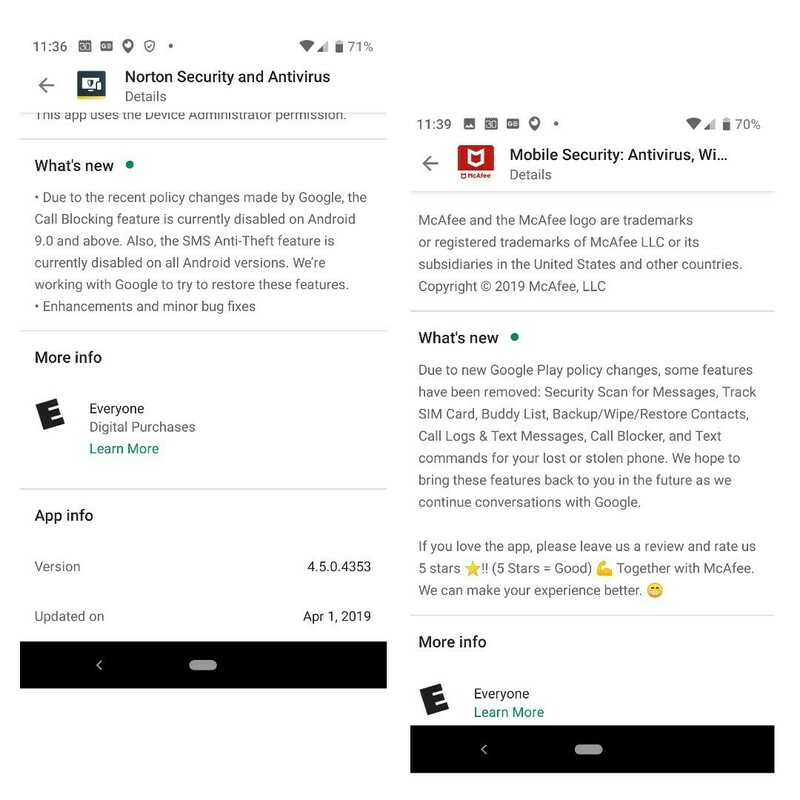 Most specifically mentioning the change regarding loss of functionality in their app notes (Norton, Malwarebytes, McAfee, Avast, F-Secure), while others I see it just mentioned in app comments (Eset). Great detective work. Then it seems to be happening to these vendors as well. Not sure if I feel better knowing the why's. But good work in reporting this! 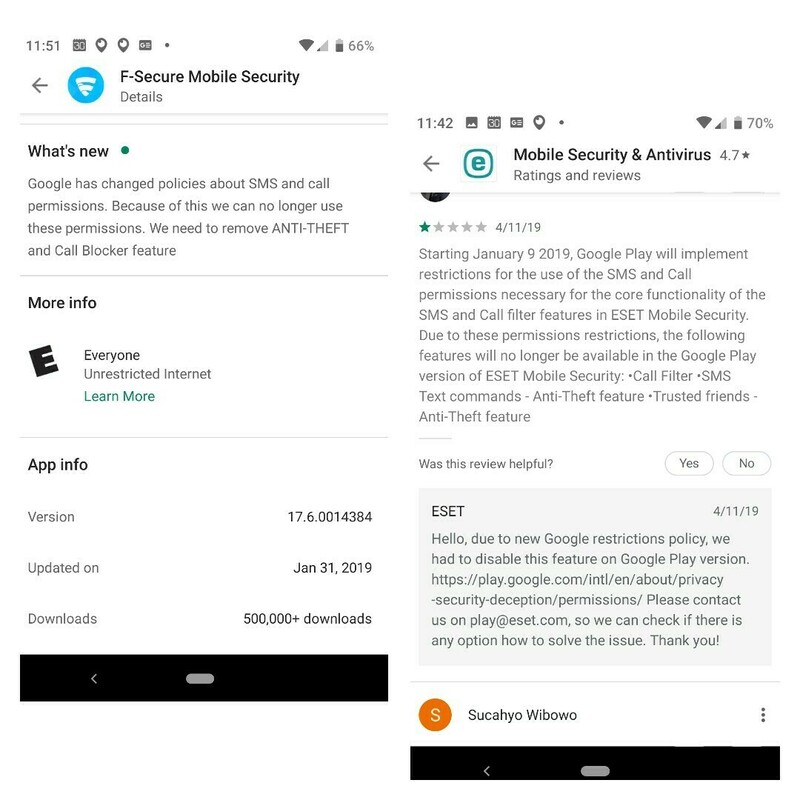 One other thing here is @Virtualpb, Those attachments and information given above in your post is saying that it is a Google issue with Call & SMS Blocking among other things with these AV vendors mentioned that they have had to drop some of their apps in their programs. Then why did @LLiddell say we lost the Call & SMS Blocking because of a survey? Huh? Thank you Virtualpb for the explanation as to why blocking has been dropped. It is an example now by Google of how we race around trying to tighten security that will only leave potentially more people open to scams. Google "how to block phone numbers on Android" and you will get a cumbersome work around solution that will force a number to your voice mail blocking it that way. Since the number has to be in your contacts it does not offer a way to block any number that does not display. As any number you wish to block has to be in your contact list it will increase the list size dramatically. Nor does it display that a particular number is being forced to voice mail. I do not know if this work around will block texting. The INDUSTRY has to come up with a more reliable user friendly way to handle this menace. Will Webroot Inc. take this concern to Google or just let the giant dictate policy ? The spamming occurs regardless of platform from "dumb" flip phones, to smartphones Android & Apple doesn't even allow security apps on their platform. I mentioned in this thread about 4 days ago that telecom & cable companies / FTC / FCC has a collaboration announced last fall to combat telemarketers & spammers. Telecoms are supposed to roll out their initiatives this year. Verizon calls theirs "Call Filtering" while others call it "Call Verification". Even before this coordinated effort, I know on Verizon you can on your web portal / provider app put numbers on a block list. On my Google Pixel phone app I can designate numbers on a blocked list - it stays locally on my phone, they do not need to be on my contact list, and I don't think it belongs to my phone service provider as I bought it unlocked from Google. Sherry - Dunno. I'm just reporting what vendors are saying. Both could be viable reasons, maybe it's just a timing and communication chain thing. The survey was a year ago. While I see the Google Play Store restrictions was announced by Google during Fall of last year. Thank you and I/we really appreciate all your involvement. And the thorough Beta information that you are involved in really helps when getting your input. It is nice to learn something everyday as I have with all your research. Keep up the great work! "On my Google Pixel phone app I can designate numbers on a blocked list - it stays locally on my phone, they do not need to be on my contact list, and I don't think it belongs to my phone service provider as I bought it unlocked from Google." On your Google phone you can have a separate list... sounds similar to what Webroot was doing. Think its just a coincident that a separate list still works on a Google phone.... I have a Moto G and have to trick it by using the contact list. I was unaware of the Google restrictions, and the product manager mentioned several features that we were looking at removing due to the survey results, these were on that list. Could be coincidence, I'm not sure. I'll ask when we're not focusing on resolving the CPU usage issue.